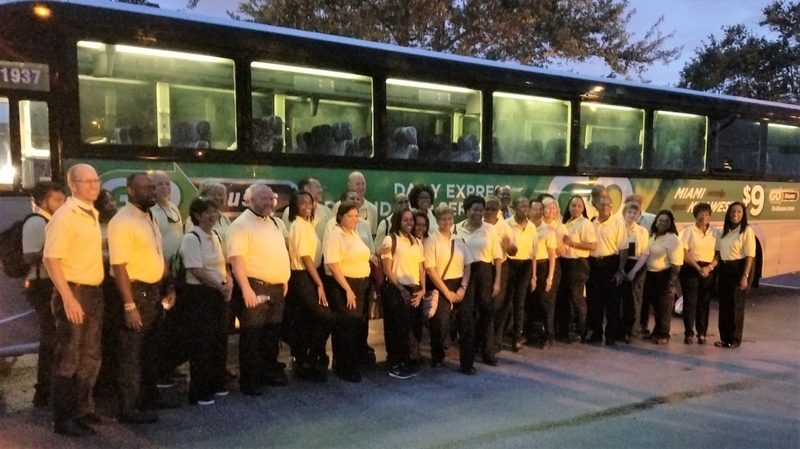 The Mission Team about to board the bus to Miami International Airport. 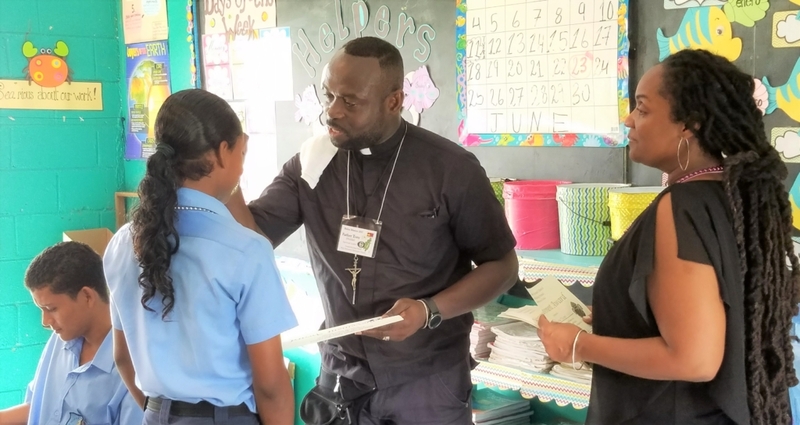 The Holy Sacrament Episcopal Church’s mission and outreach organization, “Friends Reaching Friends,” has completed its fourth mission in Belize. Led by Debbie Stevens, a member of our church, it was another amazing and successful trip. This year, 4 members of St. Paul’s Church, Vera Beach, were a part of the team that was in Belize from June 10-17. The Chairman of the village of Georgeville, Cayo District, Kenroy Myvett, expressed his gratitude to our Mission Team for being the first to offer any kind of missionary work in that community in over 25 years. The 40 missionaries were delighted that we made such an impact within that village and surrounding areas. Fr. Tony Holder and Fr. Jon Robbins during the Eucharist. reserved for us. The Eucharist was led, the Gospel was read, and a Reflection was given, by the Spiritual Leader or one of the Assistants. Missionaries read the Biblical Lesson, and led the Psalms and the Prayers of the People (Intercessory Prayers). Each day (Monday to Friday) was center on a different theme: Faith, Hope, Love, Joy, and Peace. Missionaries were expected to focus on the theme of the day as they went about their daily work and to recognize those God-moments in their lives. Before retiring to bed, one of the missionaries led the group in Compline, a night prayer service, which is usually done at the end of the day. 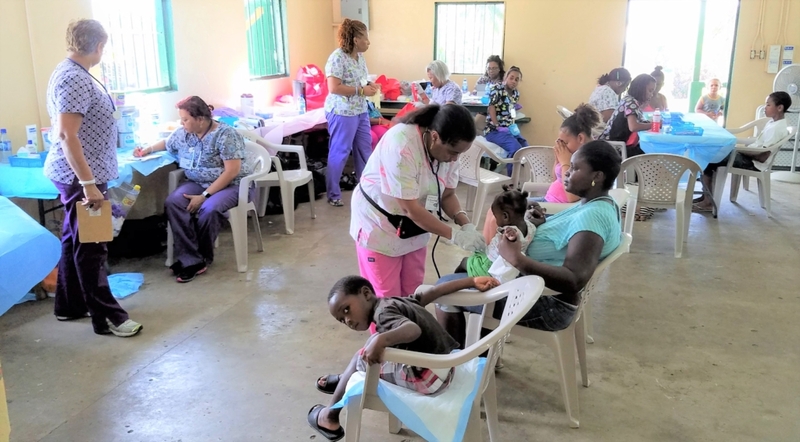 In spite of the small number of people residing in Georgeville and Central Farm, where our mission work was centered this year, nearly 550 persons (300 children in the Pediatric Health Clinic, and 215 adults with an additional 58 who returned for further evaluation in the Adult Health Clinic) were treated. These clinics, which were held at the Georgeville Community Center, featured a variety of health screenings for adults including hypertension, diabetes, neuropathy, pain symptoms, vision screening and provided with glasses, if needed. Children were treated for scabies, ear infections, skin rashes, and the like. About 95% of the adults who visited the adult medical clinic received reading glasses. Both adults and children were provided with appropriate medication and vitamins, when necessary. 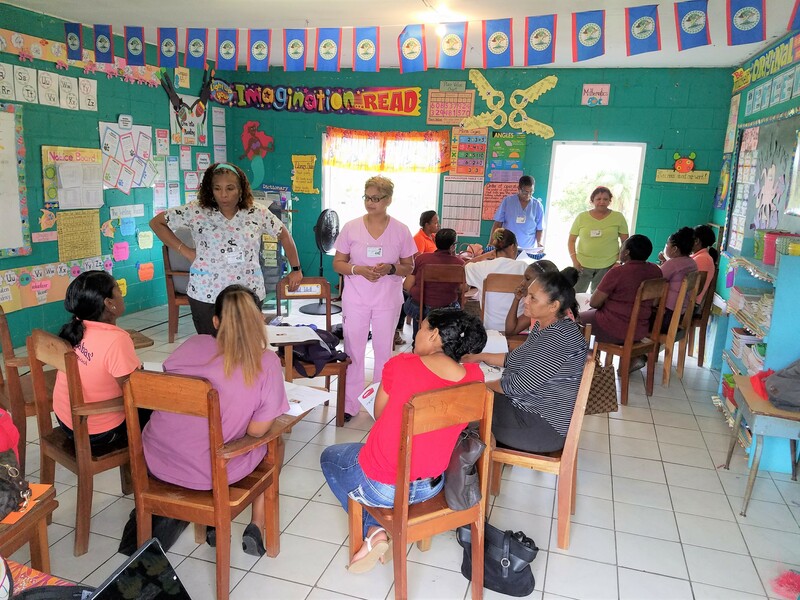 Belize has a large percentage of persons with diabetes and high blood pressure…and this was a major focus of our screening and treatments. 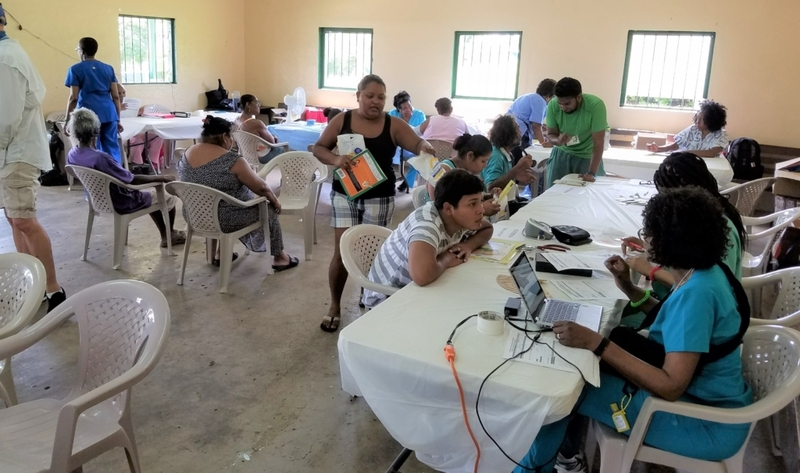 Patients’ health information were also recorded, and, at the request of the Belize Ministry of Health, information on each individual is sent to that department for follow-ups. 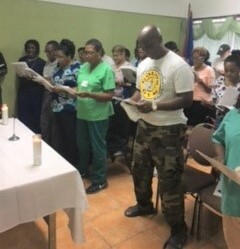 Some of the leadership team of the medical clinics along with the Mission Team and Spiritual Leaders presented health supplies to the San Ignacio Community Hospital and received a tour of the hospital. Henry Cunningham and Steven Rubino making cabinets for the sinks in the restrooms at St. Barnabas’ Anglican School. 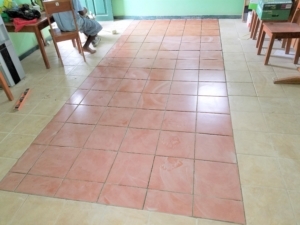 In the construction area, the 6-member team completed the following projects at St. Barnabas’ Anglican School, where 75 children are educated by 6 teachers including a Principal – painted the exterior of the restroom building, purchased and installed broken and missing tiles in the Principal’s Office, repaired gutters, replaced restroom sinks and door locks, built wooden supports for sinks, purchased and installed a 150-gallon water tank on the roof of the restroom building, repaired classroom windows, doors, stairs, and 11 broken desks. The team also donated light fixtures and provided the funds to replace broken windows. 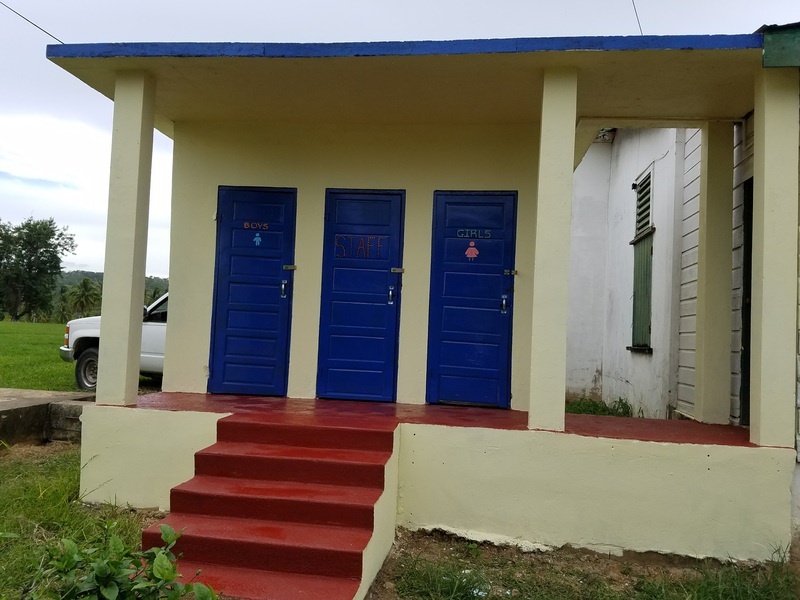 The completed restrooms for Staff, Boys and Girls at St. Barnabas’ School. The water tank installed on the roof of the restrooms at St. Barnabas’ School. 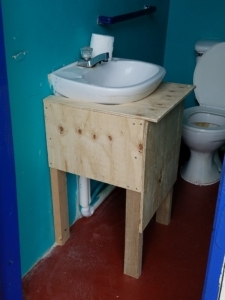 One of the cabinets that were made for the sinks. St. Hilda’s Anglican Church has a small congregation and its School educates over 150 students. The team fixed the doors of the church building, cleaned out the storage room and built wooden shelves around perimeter of the room, purchased and facilitated the installation of a 660-gallon water tank, supplied wood to repair desks, repaired restroom doors, and donated light fixtures and extra construction materials. 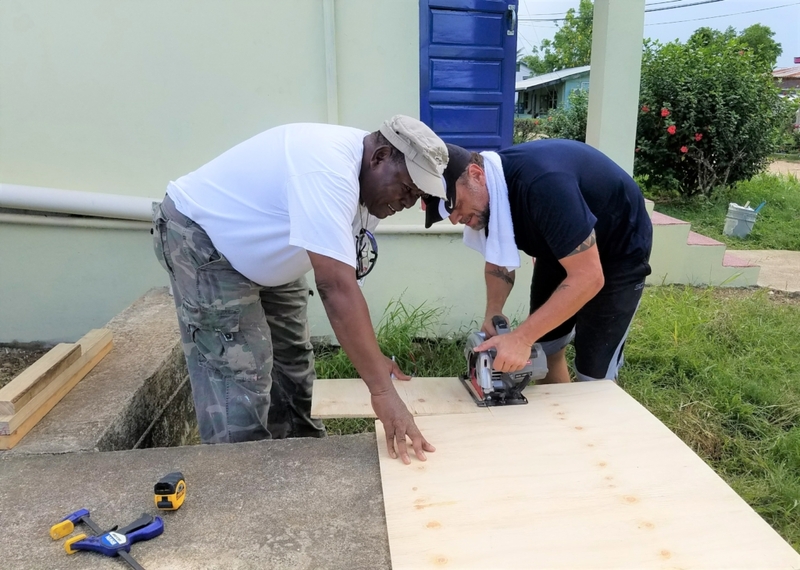 Although not originally one of their projects, the construction team repaired a window and a wooden bench at the Georgeville Community Center. Additionally, they donated vinyl tiles, and light fixtures, some of the latter will be given to the police station across the street. The re-tiling of the Principal’s Office. The children, with Marion Peynado, making their belts of truth during Vacation Bible School. The 12-member Vacation Bible School team provided Christian Education to all the children in both schools. They met with St. Hilda’s from 9:00 a.m. until 12:00 noon, and with St. Barnabas’ from 1:00 p.m. until 3:30 p.m. The theme of the program was “The Armor of God” and was based on the Scriptural text from Ephesians 6:11-18. Each day, the missionaries and children, prayed as a group, read the day’s Scripture and discussed it, recited the power verse together, participated in outdoor games, engaged in the activity book and made craft items. Dr. Dion Phillips-Scotland joins with the children in prayer during Vacation Bible School. The sub-themes, one for each day, were Introduction and the Belt of Truth (defense against the lies of the devil); The Breastplate of Righteousness (protection of our hearts and being “right with God”); The Preparation and Shoes of the Gospel of Peace (being prepared to run when battle strikes and to share the good news with those who want to hear it); The Shield of Faith (covers our weaknesses when we have neither the knowledge or strength to face a situation); and The Helmet of Salvation and Sword of the Spirit (helps us to be proactive in fighting evil through protection from thinking ungodly thoughts and Godly guidance of living and thinking). Fr. Jon Robbins and Robbie Walker engaging in the outdoor games aspect of the V.B.S. program. The Children’s Activity Books consisted primarily of coloring pages and questions relating to the sub-theme of the day. These exercises reflected the different levels, ages, needs, and developmental stages of children. The children received a certificate of achievement and gifts of bags filled with school supplies and goodies. The Spiritual Leader, Father Tony, also blessed the children at St. Hilda’s School. Fr. Tony Holder blesses one of the V.B.S. participants as he receives his certificate, while Dr. Dion Phillips-Scotland looks on. Health Workshops with St. Hilda’s and St. Barnabas. Four (4) nurses of the Pediatric Health Team presented 2 workshops on the Friday morning (June 16) to the teachers of 3 Anglican Schools. The morning session, held in Georgeville, and prior to the start of school, was attended by 12 teachers and the Principals of St. Hilda’s and St. Barnabas. A teacher of St. Andrew’s Anglican School, learning how to administer CPR under the guidance of Carol Bhim and Valerie Prescott. The lunch session was conducted for 17 teachers and the Principal of St. Andrew’s Anglican School in San Ignacio. 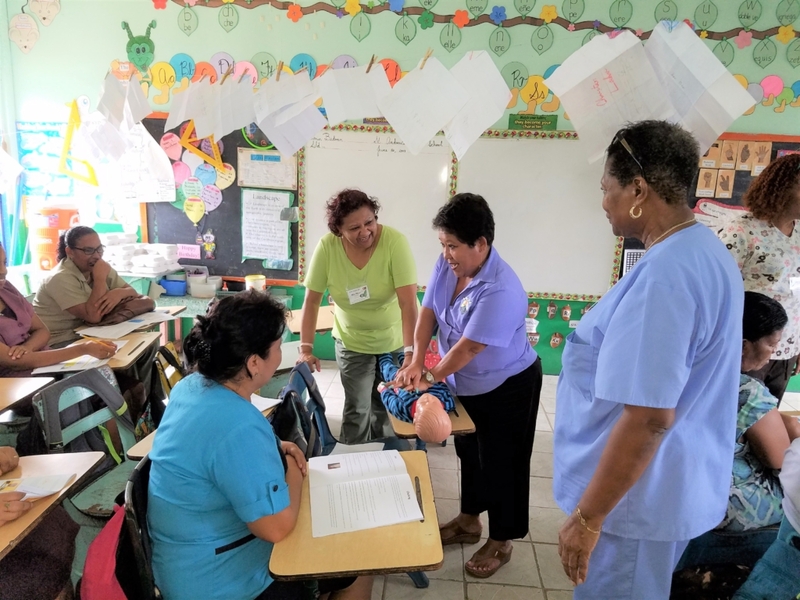 Participants received information on how to treat children for minor injuries, respiratory problems, and related issues, and were each given a booklet/handout on First Aid and Universal Health Precautions, prepared by the nurses. 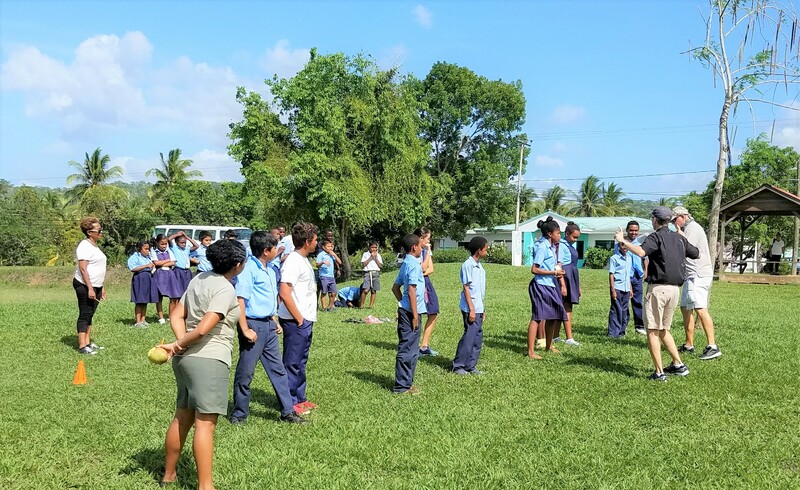 Exercises on how to administer cardiopulmonary resuscitation (CPR) were demonstrated, and each school received First Aid kits. 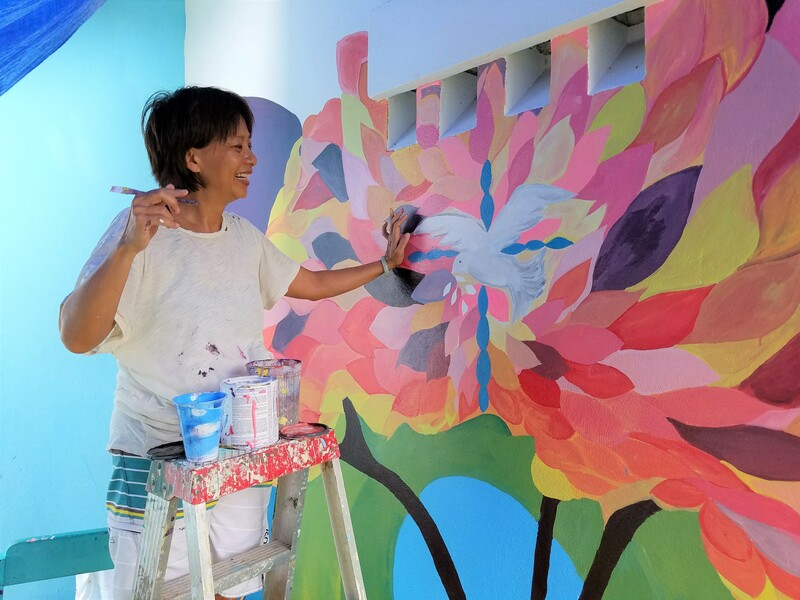 Dr. Stephanie Young-Azan, painting a colorful mural on the walls of St. Hilda’s School. 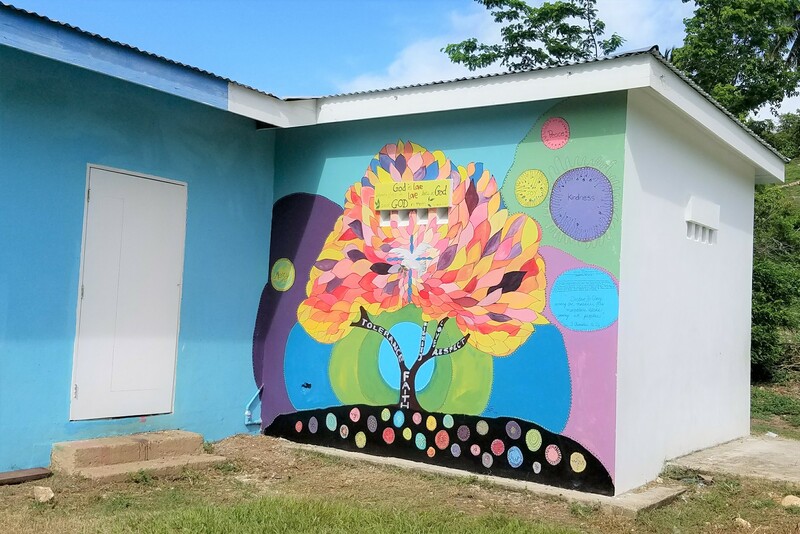 Our “resident” missionary artist, Dr. Stephanie Young-Azan, completed the beautiful mural on one of the walls of the St. Hilda’s Anglican School, Georgeville. The multi-colored, labor of love art work depicts a tree, with colorful leaves. The trunk of the tree focuses on key components of our lives – Tolerance, Dignity, Love, Respect, Faith. In some of the outer rings, Mercy and Joy are also mentioned. In the center of the tree is the cross of Christ, and a dove with an olive leaf in its mouth, possibly reminiscent of the dove that returned to the ark during the time of the flood.The dove could also be symbolic of the presence of the Holy Spirit. The artist has signed the mural with the names of all the missionaries and included 2 biblical quotes from 1 John 4:10 and 1 Chronicles 16:24. 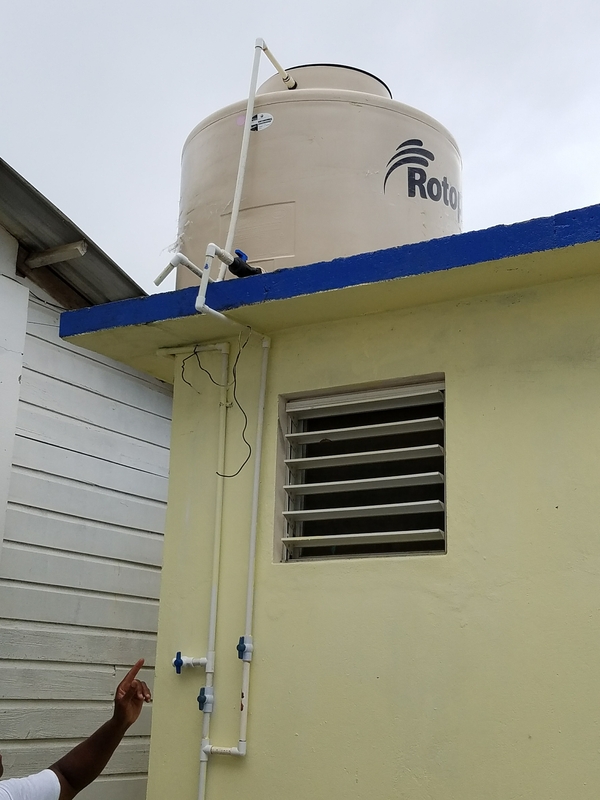 It will serve as a lasting presence of our mission in the Cayo District. 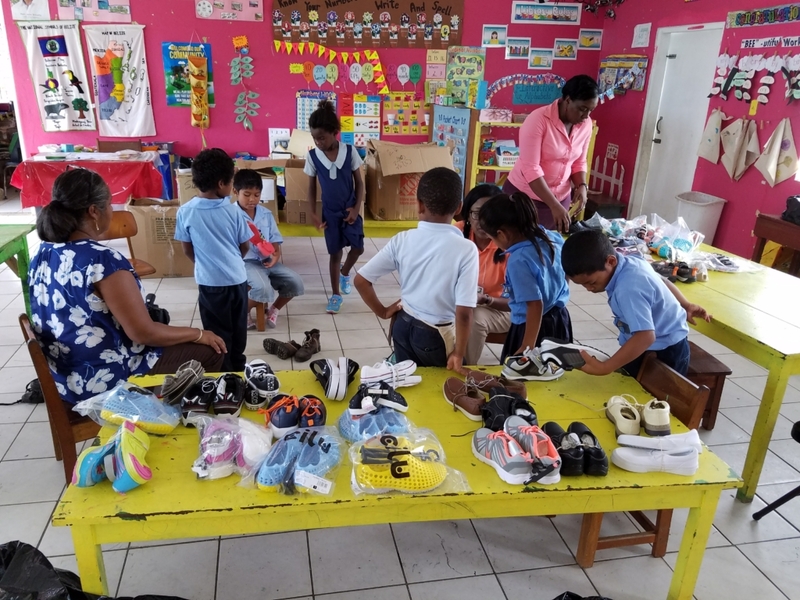 Children receiving shoes through the kind donation from Soles4Souls. A number of gifts were donated including 100 pairs of shoes from Soles4Souls, hats from Lowe’s, aprons from Home Depot, items including folding chairs and coolers from CarePlus, reading glasses from Rashawn Juman and Farhana Juman, school supplies, and the large number of material items and monetary contributions donated by Bibi Achaibar, Erna Cunningham, Chris James, Stafford Lue, Alim Rahman, Dr. Arleen Richards, Sharon Rodgers, Dr. Patricia Rowe-King, Linda Schlepp-Gray, Al Skeete, and many other material and monetary contributions. We thank these companies, individuals, the Parish Family, and friends, for their generous donations. A heartfelt thanks and appreciation to Debbie Stevens, for leading a very successful mission. Her dedication and faithfulness to the massive task was very evident and she exercised her responsibilities with humility and grace. Thanks very much to the Assistant Spiritual and Group Leaders, and to the missionaries, for the tremendous work they accomplished in just one week. Most of them sacrificed their vacation to make this all possible. They have touched the lives of so many people for years to come. Our thanks also to Bishop Philip Wright and Allana Gillett of the Anglican Diocese of Belize; Lillith Parks-Soberanis, Lay Director of CRDC; Fr. Eric Richards; Honorary Consul General Vega and Staff of Belize Consulate in Miami; Althea Young, Thomas Card, and Henry Cunningham Jr.; Jordan Paris; the Pharmacists; Kenroy Myvett, Chairman of the Georgeville Community Center; the Principals and Staff of St. Hilda’s, St. Barnabas, and St. Andrew’s Anglican Schools; Fr. 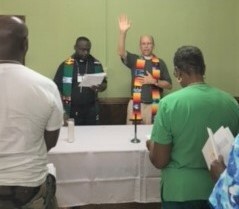 David Alenksis, Priest-in-Charge of St. Andrew’s Anglican Church, San Ignacio; Norine Bevan; the Management and Staff at Cahal Pech Village and Resort. A job well done by all…GO TEAM!